Many years ago, I was a vegetarian. Not vegan, but I ate nothing with a face. It confused my family, who had previously watched as I’d happily scarf down the biggest steak on the table. But, the conditions in which most meat is produced in the US disturbed me. Still does. If it’s organic and free-range / cage-free, fine. But, for quite a few years, my diet was all about veggies and beans and nothing with a face. And, if at all possible, I’ll gladly pay more for meat that I know hasn’t come from a cow that suffered a life of misery just to provide me with a little bit of juicy protein for my dinner. Most of the cooking I do at home these days is vegetarian, mainly because I like it, but also because my husband is not at all fond of meat. He will have fish from time to time, however, which is great. But, there are times when I crave steak. This week was one of those weeks. 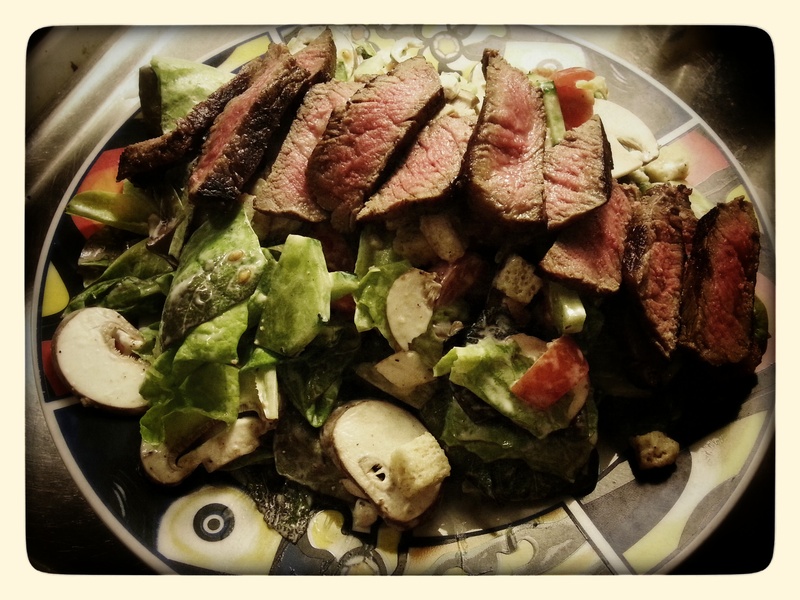 A friend had mentioned a lovely steak salad dinner she made a week or so ago. I think my taste buds have been subliminally signalling that I must make this since she mentioned it. Each time I’ve been in the supermarket since then, I’d find myself staring at the meat counter and salivating. Yesterday, I finally broke down when I saw some gorgeous marbled steaks which didn’t also break the bank. Hence, today’s picture. Big, big green mixed salad and a few additional veggies and bits of fungus all tossed with a small splash of blue cheese dressing. Topped with sliced filet of beef. Nom nom nom. I may come from the land of meat and potatoes, but this was a fine idea. Satisfied my meat munchies and didn’t leave me feeling quite so unhealthy and heavy. Apologies to the vegetarians out there! But, I do love a good steak now and again.